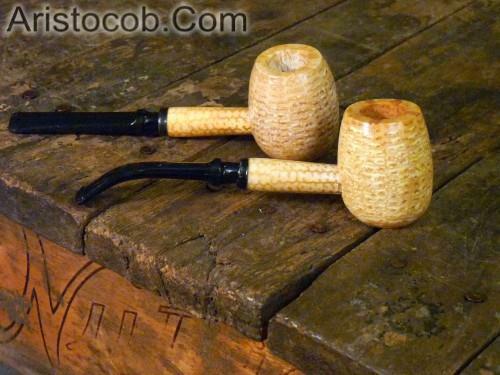 This is another one of my favorite corn cob pipes. Its large bowl is not the largest in our inventory, but it’s about the size of a traditional billiard briar, and it’s substantially larger than the Legend. The large bowl features a genuine hardwood bottom to prevent premature burn-through! The filtered stem of your new Diplomat pipe comes ready to go with only one Medico filter, so you might consider adding a pack or two of our inexpensive filters to your order. on 3/1/2019 Great service and great pipe! Just had my first smoke In my new Apple diplomat and it’s brilliant, and since cobs only really get better I’m looking forward to this one getting smoked more, great service from Aristocob and I love the tamper too! Just recieved my Bent Diplomat, filled it with Virginia Cream and off I went. A great smoker that equals many of my more expensive briars. Throw in the super fast shipping and you just cant beat dealing with Aristocob........Thanks! I got one of these a week or so ago. I cram it with cheap Paladin Black Cherry and huff on it like an uphill freight train. I cannot make it gurgle. I've been smoking a pipe on and off for forty years. I have some very nice, very expensive briars. ALL of them require at least some attention to technique, maintenance and tobacco quality to get a cool, dry smoke. Missouri Meerschaums just work. Eventually they get so stained and cracked and gnawed on that I'll throw it away and by a new one but they last a looong time. I've never had one fail. I always have at least one around to smoke while I am futzing with my "good" pipes. I'm particularly fond of this Diplomat.